The river of life is always changing. Mud on the banks gives way, pools deepen and swirl, stones tumble. A bend is worn away, and the water flows faster. A boulder moves one inch, resulting in a new splash pattern. A tree trunk falls across the span, creating a natural dam. Some change is spontaneous, some change is volitional. Our planet is calling for change. Our hearts are yearning for change. We hear the call to become agents of change. And the most important change begins within. meditations, visionary journeys, purifications, and ceremonies. When there is unrest in our lives and world, there is unrest in the numinous realms. When our spirits are ill at ease, we suffer. When our guardians and guides are not receiving the attention they deserve, we get lost. When we fail to practice, we miss an opportunity to cultivate life force. When peace is possible in one world, peace is possible in all worlds. abandoning ourselves to a convoluted and vexing world? How often do we chase fantasy and myth when we actually crave the substance of authentic spiritual practice? Today, many of us hunger for greater intimacy with nature and the spirits as a balm to our turbulent inner dialogue. when we can stand quietly, humbly, barefoot, and skin-to-skin with Mother Earth in the witness of our ancestors. The Woman Shaman Priestess Training Program is about coming home to yourself. Instructor Yeshe Matthews knows what it feels like to be a "hungry ghost" searching through a hell of one’s own making for hollow comforts amidst the chaos, finding that nothing helps except spaciousness, the wildness of nature, and freedom of the soul. Have you been there? Are you fed up with feeling anxious, exhausted, and hungry for peace? Are you ready to work with your female power, the spirit world, your lineage, and your relationship to the Earth in a deeper way? Yeshe offers Woman Shaman Priestess training for women who are ready to make a significant change in their lives, to listen their bodies, to connect with their natural female power, and to give 100% of their magic to spiritual wholeness for the benefit of all beings. 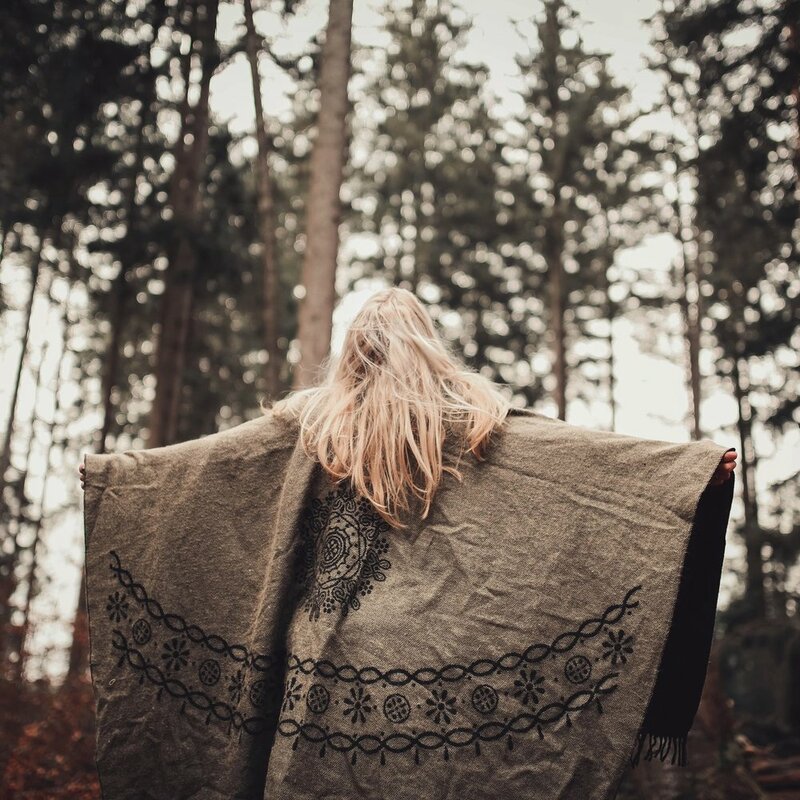 The Woman Shaman Priestess journey can help you flow like a river and change your own life dramatically by deeply attuning to nature, healing practices, Goddess, innate female wisdom, and magic. Healing the Self and the Earth won’t happen overnight, nor will they happen if we keep doing the same things we have always done. Healing requires time, energy, and dedication. This 12-month program is designed to help you make real changes and real magic in real time. It's potent and demanding, and you won't regret it. Yes, there is a Spirit in the body of the drum carved out of the trunk of a tree; there is a Spirit in the skin of the drum itself. All this, plus the Spirit of the person playing the drum, becomes an irresistible force against any immovable object. The first sound we hear in the womb is our mother's heartbeat…And this pulse is the thread of blood that runs all the way back through the grandmothers to the first mother. We all share the blood of the first mother - we are truly children of one blood. You are invited to this lastingly transformative work, if your spirit is calling for the kind of wisdom that only the Earth and women’s mysteries can offer. This is a path for the woman who has looked at the bottom of her own soul, and who is ready to be reunited with her deep, innate power, her courageous heart, and her intuitive, mystic vision. Is it time for this work in your life? During the course of this Priestess training, you will come into awareness of your lineage, connect with your ancestors, create habits of reverence for your own sacred body and the Earth, learn to listen to your animal knowing, and cultivate life force to benefit yourself and the other beings in the visible and numinous realms. With a Master's degree in Women's History, a spiritual focus on shamanic practices, and a deep connection to the natural world, Yeshe Matthews brings over a decade of experience as a Priestess, professional diviner, and ritual facilitator to her teaching. Yeshe trains Priestesses to access their magical potential and create positive change via ancient and modern methods of inquiry, spiritual exercises, and ecstatic devotion. Dedicated, practical, and discerning, Yeshe helps female agents of change activate and focus their power. Please prepare to spend time each week reading and digesting the lessons, and trying the practices that are offered as part of this course. You will find yourself moving slowly and sustainably through subtle but effective techniques, building capacity, relationships, and respect with practices and spirits. This course helps introduce you to new ways of thinking about reality and your power to commune with it, influence it, and shape it with benevolence toward all beings (including yourself). The next year-long Woman Shaman Priestess journey begins January 7, 2019. If you are feeling called to take this journey in 2019, the time has come to sign up! We will have both online and local gatherings for this class in 2019. Lessons will be delivered via email, while classes, Full Moon ceremonies, and Dark Moon ceremonies will be available both online via video and in-person near Mt Shasta. Whether you live locally or at a distance, there are options for you. Class fees for the Woman Shaman Priestess program are collected through the Mt Shasta Goddess Temple Patreon account. This will mean that tuition comes automatically out of your account or on your card on the 1st of each month. Create a Login and password, and then scroll down the Temple's page on the right until you see Woman Shaman Priestess ($60 per month), or if you prefer to have the class plus a monthly Session with Yeshe, sign up for the Mandala of the Stars ($108 per month). It is recommended that you have at least three sessions in the year: at the beginning, in the middle, and at the end. This will help you identify key themes and gifts that are emerging during your training. If you give yourself one gift in 2019, give yourself this journey. It will equip you with a set of skills, tools, and perspectives that can help you achieve your goals. Students in years past wrote books, started organizations and circles, improved their health, launched new relationships, and identified their personal gifts with greater precision than ever before. This program is all about your magic, your power, and your ability to live a life of your own design, as an embodiment of Goddess on Earth. If it's time for you to claim your seat at the table of ancient future wisdom, sister, please come join us.